On my first Camino three years ago, my friend Rick and I would see people with small daypacks. These were the people who hired a service to bring their packs to their destination instead of carrying them themselves. “This walk would be a piece of cake if I wasn’t carrying a pack!” Rick would say. “Yeah, I could walk so much further if I didn’t have my pack,” I added. A few days ago, I learned we were right. For the first time ever on the Camino, there was no belt cinched tight around my waist, no straps pulling on my shoulders. I carried a tiny bag on my back that held water, my jacket, and some snacks. “You already did this trail once carrying your pack. You’ve got that story to tell your grandkids,” Lois told me.”You’ve got nothing to prove, kid. And me? I’m only doing this once and I’m here to enjoy it. We can enjoy it a lot more without carrying our packs.” Well, since she put it that way . . . I studied myself that day–how I felt being on the other side of the carry-your-pack or not debate. I didn’t feel guilty–initially. I did, however, wonder how other people would react to us, but was surprised to see we got the same “Buen Camino” greetings we received the day before. A few hours into our day, after crossing a busy mountain road, we got to a food truck. Plastic chairs held weary pilgrims, their packs and walking sticks strewn about the pavement. Lois and I stood looking at our food options as a large man dropped his equally large pack and settled himself into a chair beside me with a big sigh. We smiled at each other, and I patted his back, then started to massage his shoulders. A man sitting across from him said, in an Irish accent, “Over here next!” pointing to his own shoulders. We all exchanged answers to “Where are you from” and “where are you going today.” I let out that this was my third Camino. “You’ve done this twice already? From St. Jean?” “No–I’ve done this route once before, and did 10 days on the Portugese last year.” I very deliberately did not add, “carrying my pack the whole time.” These men had seen Lois and I arrive. Looking at Lois, one would easily forgive her for not carrying a pack. But me? What was my reason? Did I need one? I’ve just finished my third day without my pack. And the guilt has come and gone and come and gone again. Yesterday, a German man caught up with us and one of the first things he said was, “I see you’re not carrying much.” I stumbled over an explanation. In case I have to carry Lois. My pack? You mean it’s not on my back? Hm. The better question is why are you carrying yours? I’m probably carrying about as much as the pilgrims of the middle ages carried. “People can’t have a one-sided conversation,” Lois said. In other words, I didn’t have to say anything. That hadn’t occured to me. “You know it’s not personal–he asked about your pack to make himself feel better.” Indeed, this idea of “it’s not personal” is one of the best things I’ve learned from Lois. During my Camino, I wrote an entire blog post on that very topic. Upon my return, I contacted the woman who had shared her wisdom with me. She had read the blog post and wanted to tell me why she had her pack ported: she had a family member with special needs. Every day she felt like she was carrying more weight than she could bear. 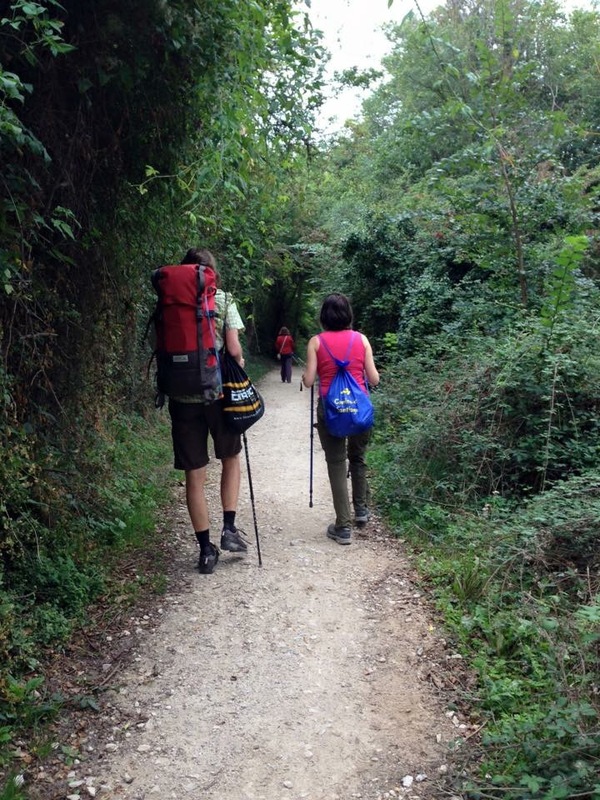 The Camino was her chance to let someone else shoulder her burden. Her words stuck with me and I hoped to carry that lesson for the rest of my life. Who was I to judge? Rarely do we have the whole story, and even if we do, what good does my judgement do anyone? Of course, living this lesson is easier said than done. Such was the case on day 3 of our Camino, when I walked up to the front door of the Corazon Puro, at which we had a reservation. The owners looked down on me and in very few words dismissed me: I had been told to arrive by 3 p.m. and it was 3:15. They informed me they’d given our room away. I freely admit I had forgotten they had told me to arrive by 3 p.m. But four pilgrims who had stayed at this place had raved about how wonderful the owners were, and their curt dismissal left me stunned. As I told Lois what they said to me, tears sprung to my eyes. I knew there must be some explanation for their attitude. But at that moment I couldn’t get over it. Lois and I found a bench and sat down to talk about our next steps. We decided we’d go back to the bar we passed and call a taxi to take us back to Burguete, a town we walked through that we thought looked like a wonderful place to spend a night. On the way to the bar, however, we saw a handwritten sign that said, “Rooms.” Nearby another sign indicated the name of the place: La Posada Nueva. I recognized it from our guidebook and we decided to take a look. I inquired in my broken Spanish, and asked the woman if we could see a room. She indicated that would be fine, but asked kindly for us to leave our hiking shoes in the space under the stairs. I was spent and flopped onto the couch. “You go look,” I told Lois. “I’m still too flustered to make any decisions.” Let alone climb any stairs. A few minutes later I heard Lois exclaim and start laughing. She returned with a thumbs up, telling me two friends we’d met earlier in our trip were staying in the room next to ours. I breathed a deep sigh, unlaced my shoes, and hauled my bag upstairs. That evening, over a meal home-cooked by the proprietor, we dined with our friends Mandy and Bill, another Rebecca we’d met the day before, and a couple from–of all places–Asheville, NC. We shared our stories over our first course of perfectly seasoned garden-grown tomatoes and cucumbers. We shared our greatest challenges during the main course of pasta with blue cheese, rabbit, and tortilla. The wine and laughter continued to pour forth as we devoured our apple cake for dessert. The next day, friends that spent the previous night at Corazon Pura told us they were unsure why we were turned away–there were only three pilgrims in the entire place. I will never know, and have decided to let it go. Who am I to judge? In 2011, when I first hatched my plan to walk the Camino de Santiago hardly anyone I knew had ever heard of it, let alone walked it. But I was lucky enough to get first-hand advice from people I have not, to this day, ever met. Six weeks after my return an opportunity presented itself–an opportunity unlike any I could have ever imagined. I learned there was a weekly gathering of returned pilgrims at a coffee shop within walking distance of my new home. They met every Tuesday at 9 AM to not only reminisce, but to share their wisdom with anyone they knew of who was interested in walking The Way. At the first meeting, I was hooked. Here was a group of people who understood exactly what I had done and what I was grappling with coming back to the real world after such an experience. And here was a way for me to share my knowledge with future pilgrims. Not only did I attend nearly every week, but I also offered to meet future pilgrims one-on-one for coffee or lunch, and was delighted every time my offer was excepted. Thanks to this group, rare is it for someone from the Asheville area to go on the Camino with as little knowledge as I had the first time. After my first day of walking the Camino in 2012 I had the pleasure of meeting Vincent and Franco, friends from Italy walking the Camino together. Vincent was on his third Camino and was accompanying his friend Franco who was walking it for the first time. After buying me a drink, Vincent opened my guidebook and marked everyplace he recommended I stay. He told me about the parish Hostel in Granon where a meal is prepared and eaten together and a candlelit service is held in the church next-door each evening. He circled the town of Moratinos and next to it wrote, “Italiano,” explaining that two Italians had just opened a hostel there and I would be guaranteed a delicious meal along with wonderful hospitality. It has occurred to me that I am in Vincent’s shoes this time: an experienced pilgrim guiding a first-timer. And, like Vincent, I am thrilled to help whomever else I can. I learned they were lost. And though it had been 3 1/2 years since I had been in this town, I knew where they needed to go. It was on our way to our destination, so I walked with them, learning they were from South Korea and had a reservation at a hostel further along the route. I let them know their destination was three hours away and when we parted ways I wished them Buen Camino.